The Fat Plant Society is a Kansas City based business offering moss wall installations, custom moss frames, handmade vertical planters and succulent planters. The Fat Plant Society owner and founder, Morten Klinte, is a Danish national. Born and raised in Copenhagen, Denmark amidst the art influences of his mother, a lithographer and painter, as well as the Scandinavian aesthetic. Morten Klinte immigrated to the U.S. in 1999 and has a textbook immigrant story, having arrived in Kansas City with his American wife, Kasey (who he knew for only two weeks before marrying) and $200 in his pocket. Since immigrating to the U.S., Morten had been trying to bring the best of Denmark to Kansas City by creating hygge in his home and office but it wasn't until his "apprenticeship" at Family Tree Nursery that Morten found his true inspiration---to create handmade succulent planters that truly feature the succulent. 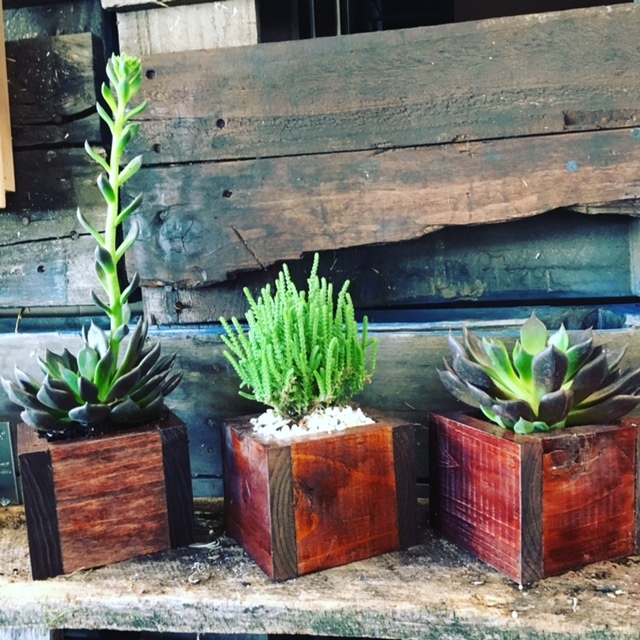 As Morten says, he likes to put succulents on a pedestal and his handmade, hand stained boxes reflect just that. Morten returned to his home country with his wife in 2015 with an aim to re-establish their lives in Copenhagen but despite their best efforts to re-acclimate in Copenhagen, Kansas City and the long, warm, growing season beckoned. Copenhagen was a constant source of inspiration with its clean lines and natural beauty. It was while he was in Copenhagen that Morten fully developed and honed the business idea of utilizing moss as a design element (the Danish forest is quite an inspiration) handmade succulent planters infused with the Danish aesthetic. Returning to the U.S. from Copenhagen, Morten and Kasey took up residence with friends at the Lake of the Ozarks and worked for months to refine The Fat Plant Society concept. Morten taught himself how to construct handmade planters and vertical plant frames using recycled and re-purposed wood such as old dressers and salvaged barn wood. Morten also began research and study of biomimicry--the art and practice of utilizing moss and plants to mimic the outdoors in interior spaces. Morten's friends provided assistance and he set up shop in the back of pal Jerry's plant nursery (Sunshine Flowers) in Kansas City, just blocks from his West Plaza home. Morten utilizes the space as both a workshop and a retail location and spends six days a week making moss frames, custom moss walls, crafting his planters and talking with customers about plants (of which he never tires). Morten's wife, Kasey Riley, is the co-founder and CMO for The Fat Plant Society and lends her design skills and labor as needed to ensure The Fat Plant Society clients get a final product that meets (and hopefully exceeds) their expectations. It is through networking and personal interactions that Morten and Kasey have connected with new clients, vendors, potential customers, and collaborators. As highly social people who love not only what they do but the community they live in, Kasey and Morten plan to continue to grow (pun intentional) The Fat Plant Society into a West Plaza and Kansas City fixture. Stop in and see them, they're nice people with a sincere love for all things green.